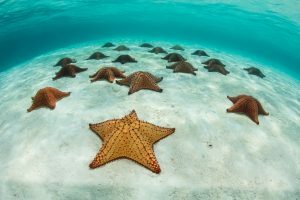 Latin America – Lonely Planet Names Panama & Belize Top Travel Spots for 2019! 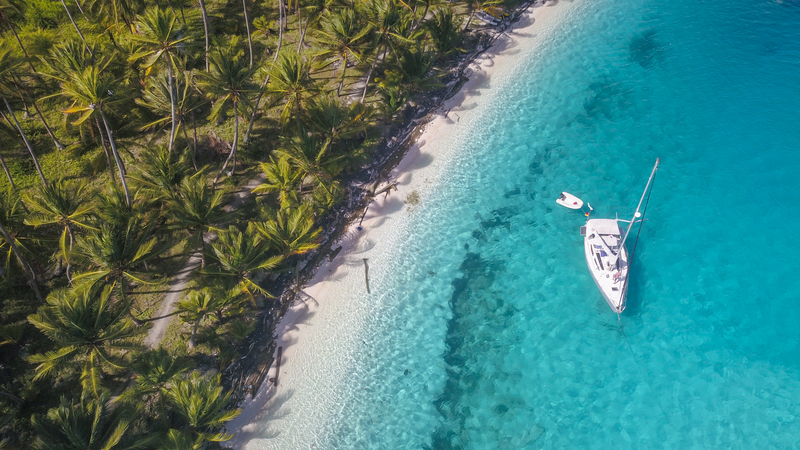 Panama and Belize are primed to be among the hottest travel trends for 2019. Get ahead of the travel trends and come discover their magic. The way we see it, the yearly Best in Travel announcement by Lonely Planet isn’t so much a prediction but more of a synthesised summary of growing trends. At Chimu Adventures, we can certainly attest to both Panama and Belize enjoying a swift rise in Latin American ranks in the last 12 months, as has been the case for the entire Central American region. The two hot-spots are absolutely delightful and quite different from what many people may imagine. Of the two, Belize is undoubtedly the most renowned, most especially among avid SCUBA divers. This is one of the world’s best diving and snorkelling destinations and within this dedicated crowd, Belize sells itself. So it’s the inclusion of Panama that has us most excited, in many ways. 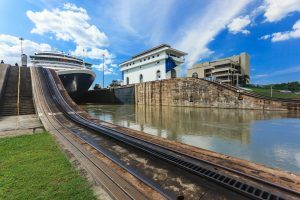 Yes, the country is an exceptional springboard and stop-over hub on Central and South America travels and yes, the Panama Canal is a man-made marvel everyone should see at least once in their life. Yet Panama is so much more than that – so much more than a convenient international airport and so much more than a single canal. Epic as it may well be. The marvellous coast line of Panama is a diver’s paradise. Credit: Shutterstock. Panama is magnificent Caribbean islands and a mind-boggling array of gorgeous beaches, most especially on the Caribbean side. It’s luscious rainforests brimming with wildlife and traditional indigenous tribes that still carve their canoes by hand and fish for their supper. It’s gourmet dining and designer shopping amidst stunning colonial architecture in the capital and playing Robinson Crusoe on deserted islands; about birdwatching in UNESCO-listed reserves, climbing volcanoes and visiting historic coffee plantations. In Panama – all this gorgeousness is right there for the taking, all close by and all doable within just a few days. The vibrant Panama City. Credit: Shutterstock. 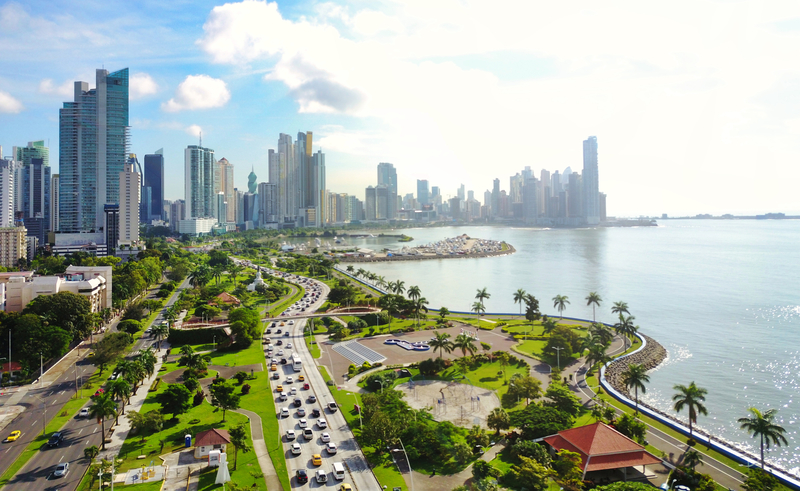 Panama City – The historic hub that connects North and South America, Panama City is most people’s first taste of the country and although many visitors plan a swift in-and-out visit you’d be smart to include a few days here to explore it further. Behind the swanky façade of futuristic skyscrapers lies the Old Town Centre, Casco Viejo (also called San Felipe) a history lover’s dream. This UNESCO-listed treasure is beautifully preserved and brimming with amazing architecture, super cool cafés, great museums (including the Panama Canal Museum), excellent restaurants and fabulous nightlight. This is the waterfront heart-beat of Panama and definitely the top spot to stay. 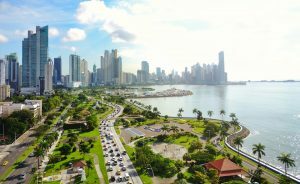 There’s a ton of stuff to see and do in Panama City: see megaships negotiate the challenging canal from a viewpoint at the Miraflores Locks, the remnants of the original 16th-century city’s Panama Viejo, stretch your legs in search of toucans, big cats and sloths in the city centre’s very own wilderness reserve (Metropolitan Nature Park) and take a day-trip to the Gamboa Rainforest Reserve and adjoining Soberania National Park for boat trips and 4WD wildlife safaris. The world-famous Panama Canal. Credit: Shutterstock. 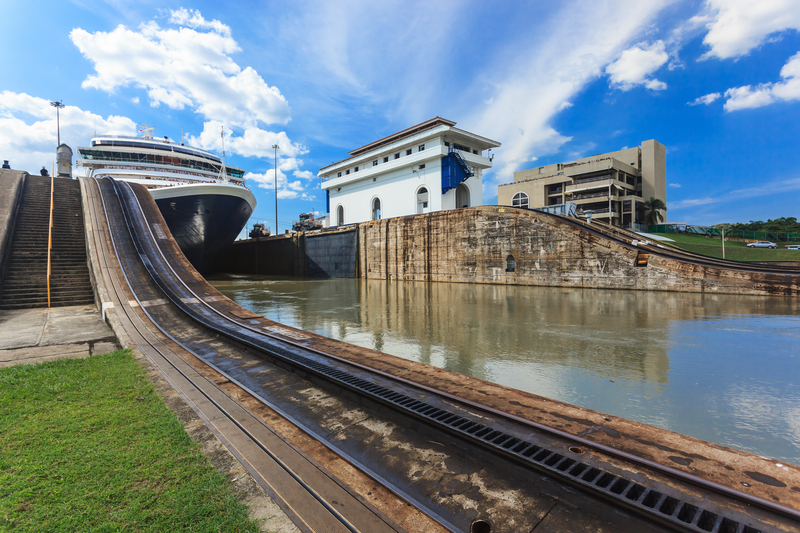 The Panama Canal – The main tourist draw in Panama really is awe-inspiring. After you’ve visited the museum and learnt about the agonising history behind its construction you’ll no doubt want to experience it, first hand. You can easily do this by joining a 7-day cruise along the Panama Canal, stopping to visit wildlife-brimming jungles along the way. Our Discovery Panama Canal Cruise offers the best of the canal, including not just a once-in-a-lifetime cruising experience but also introducing you to the magical rainforests that frame it and the stunning Pearl Islands that lie just to the south. Jaguars are among the amazing wildlife species to be found in Belize. Credit: Shutterstock. 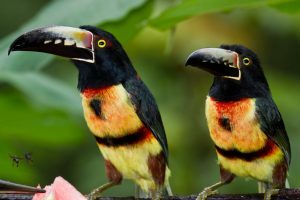 The National Parks & Wildlife of Panama – The wild side of Panama is perhaps its most overlooked side and the most delightful secret to unveil. Almost 40% of the country is designated as protected reserves and, in total, there are more than 100 national parks and wildlife reserves (both terrestrial and marine) covering a mind-boggling area OF5 million acres. Amongst all this pristine wilderness hides a cache of exceptional creatures. Panama is home to jaguars, coatis, sloths, tapirs, toucans, ocelots, anteaters, armadillos and several species of monkeys amongst its 1500 wildlife species. More than 130 of these are totally unique to the country. Wildlife watching is amazing in Panama and bird-watching is particularly rewarding. Panama lies on the flight corridor between North and South America and, given its unspoilt nature, it acts as a prime rest-spot for migratory birds in the continent. 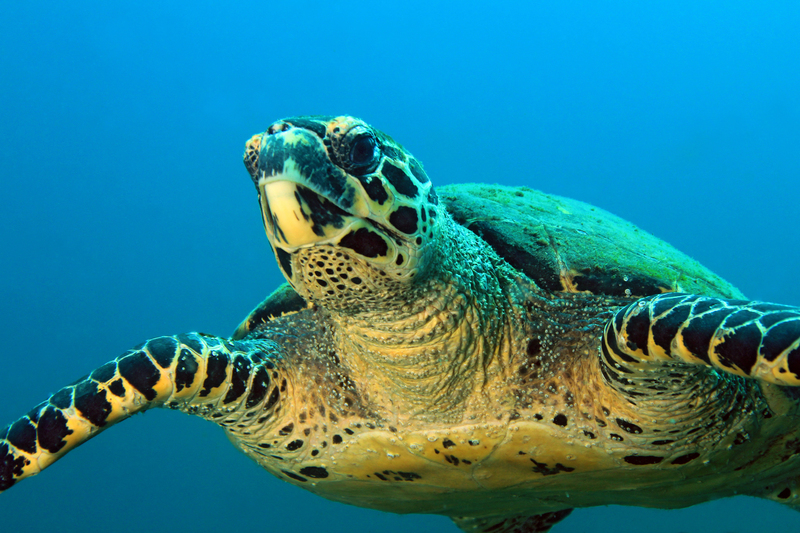 The diverse and exotic marine wildlife in Panama. Credit: Shutterstock. 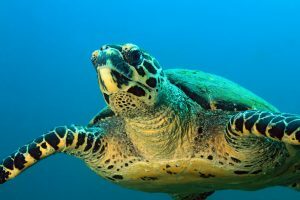 The Islands & Marine Life of Panama – Central America, in general, is revered by snorkellers and SCUBA-diving aficionados and every country here – with the exception of Panama – is famous beyond words for seaside escapades. This actually makes Panama a hidden treasure to explore given lower tourist crowds and unburdened coral reefs. Framed by the Caribbean Atlantic in the north and the Pacific in the south, Panama is blessed with an array of marine life, including five species of turtles, humpback, sperm and orca whales, at least four different species of sharks and several dolphin species as well. There are nearly 300 square kilometres of coral reefs in Panama, home to untold numbers of colourful tropical fish. Some of the most prominent islands to visit – those home to the most important reefs with the greatest diversity – are the abovementioned Las Perlas and Coiba Island on the Pacific side and the magnificent Bocas del Toro archipelago and the adjoining Bastimento Island on the Caribbean. The latter is Panama’s first marine national park and remains, without a doubt, the country’s foremost natural treasure. Home to the northern hemisphere’s largest coral reef, the Belize Barrier Reef, and boasting one of the lowest population densities in all of Latin America, makes Belize a natural paradise bar none. The country’s lack of major infrastructure and all-inclusive resorts means Belize receives a very different kind of tourist, one who’s more impressed with nature’s richness rather than man’s. 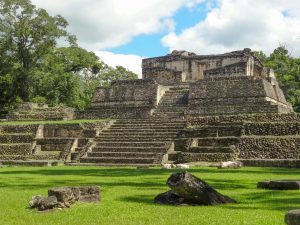 Belize also offers an intoxicating mix of culture and history, with several prominent Mayan ruins found in its luscious jungles. The Great Blue Hole in Belize is a breathtaking natural sight. Credit: Shutterstock. 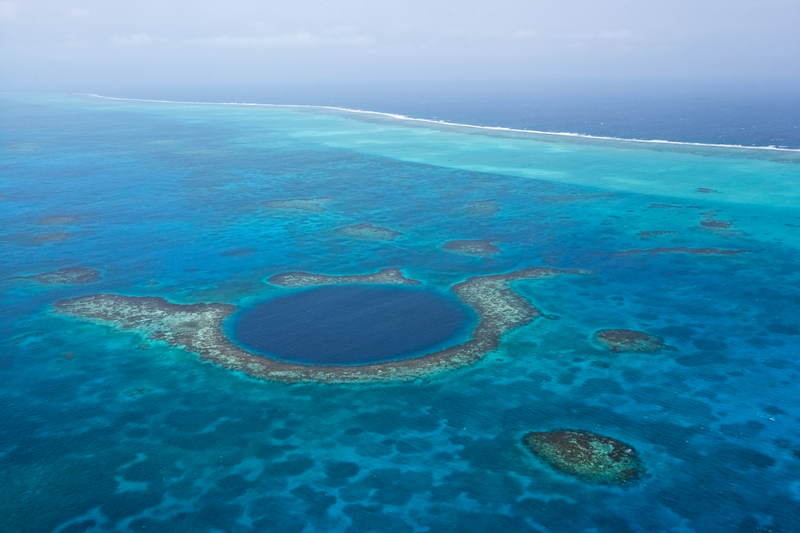 The Great Blue Hole – The poster-child for the Belize tourism industry, the Great Blue Hole is a breath-taking spectacle and the most popular SCUBA-diving destination of all. 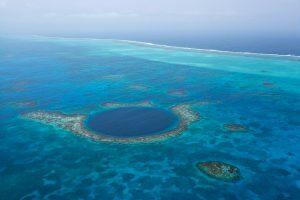 The astonishing marine sinkhole, the largest of its kind in the world, lies at the heart of the Lighthouse Reef merely 100km off the coast and easily accessible from Belize City. Part of the Belize Barrier Reef, the largest coral ecosystem on the northern hemisphere, the Great Blue Hole is one dreamy diving spot among many, many more. Here, you’ll see ethereal stalactites and unreal shades of blue and, around it on shallower waters, a magnificent world of colourful marine life. Belize has excellent conditions for passionate divers and snorkelers. Credit: Shutterstock. More Snorkelling and SCUBA Diving – The entire Belizean coastline is littered with fantastic atolls and cays, all of which offer superb snorkelling and diving. The UNESCO-listed barrier reef protects untold marine species, including sea turtles and majestic rays, which in turn attracts sharks and dolphins galore. The waters of Belize are clean, the coral unbleached, the marine life resplendent – there really is no better place in the world to explore with goggles and fins. You can head off on boat-trips to stellar spots like the Lighthouse Reef and the Hol Chan Marine Reserve and Shark-Ray Alley, or snorkel right off the beach at the Glovers Reef Atoll. 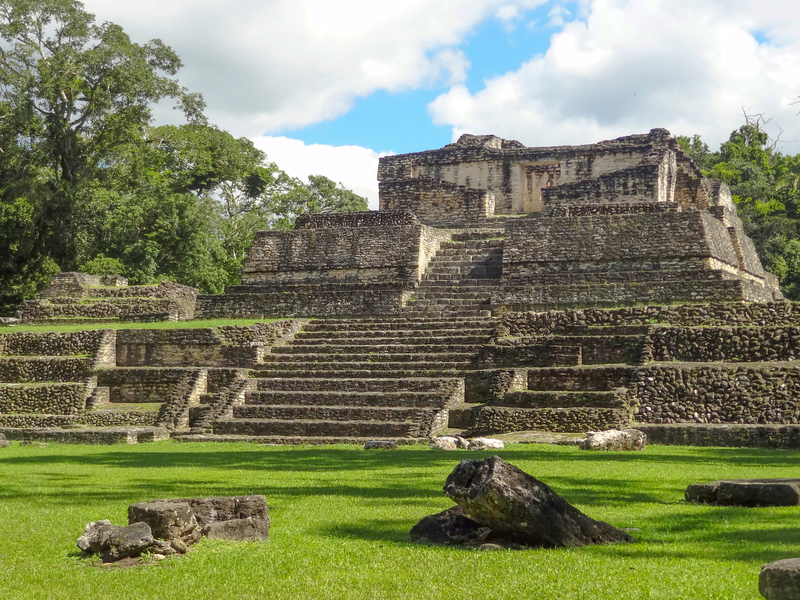 Maya Ruins – Belize boasts a fascinating history and has been a melting pot of cultures for thousands of years. This was the heart and soul of the ancient Maya civilization and, nowadays, Belize boasts the highest concentration of Maya ruins in the region. The pyramids of Caracol are arresting and spellbinding and, more famously, still the tallest structures in the entire country. Once home to over 150,000 people, Caracol was one the Maya culture’s largest metropolis. Discovering the Maya ruins in Belize’s jungles is like travelling back in time. Credit: Shutterstock. Other prominent and rewarding sites to visit include Lamanai (still half-hidden among a thick jungle cover) and Xunantunich, found right by the border with Guatemala. This formidable ancient city is believed to be more than 2500 years old and comprises more than 20 plazas and pyramids. The wildlife in Belize’s nature is an absolute must-see. Credit: Shutterstock. 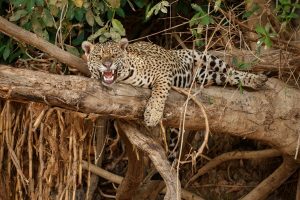 The Wildlife of Belize – Given the low population density and the very high wilderness density, Belize is – rather unsurprisingly – a haven for all creatures great and small. Belize is home to 150 species of mammals (including five big cats) 140 reptiles (almost 60 species of snakes!) and more than 500 exotic species of birds. Wildlife-watching is an inherent part of travel in Belize and usually makes for the most unforgettable travel experiences. Ready to explore Latin America’s newest travel hot-spots? Then see our comprehensive collection of Central America Tours and come discover the region’s best hidden surprises. Explore the best of Central America visiting Panama, Cuba, Guatemala, Belize and Mexico on this 22-day journey.